Joshua Tree National Park flawlessly combines breathtaking beauty, incredible recreational opportunities, and a colorful, wild-west history. Before it was a national park, Joshua Tree was home to cattle rustlers, gunslingers, miners, and rugged homesteaders. It was a harsh environment to eek out a living, and nobody did it more successfully or profitably than jack-of-all-trades, Bill Keys and his homesteading family. The Keys family lived in what is now Joshua Tree National Park for more than 60 years, raising five children, and surviving on perseverance, luck, and shrewd dealings. The story of the Keys Ranch and the people who called it home for so many years is fascinating. The ranch itself has been meticulously preserved, and remains almost exactly the way it was left when Keys died in 1969. It was listed on the National Register of Historic Places in 1975. In order to preserve the authentic nature of the Desert Queen Ranch, visitors are not allowed unless they are part of a ranger-led tour. Securing your spot will take some extra work, but it is so worth it! Tours are available from May to October on Thursday, Friday, and Saturday at 2 pm. To make matters more complicated, you have to buy your tickets at the Oasis Visitor Center the morning of your tour. Visiting and photographing the Desert Queen Ranch was one of the highlights of our visit to Joshua Tree National Park. The ranger giving the talk knows everything there is to know about the Keys family and the history of the ranch. He’s super funny and really engaging. You’ll spend about 1.5 hours walking around the grounds hearing stories about Bill and Frances Keys and their eclectic life on the Desert Queen Ranch. You can’t go into the house the family lived in, but you can peak in the windows, and you can check out all of the outbuildings on the property. The Keys Ranch tour is great for older kids who enjoy history. My teenager loved checking out all of the artifacts and taking pictures as we toured the property. The land where the Desert Queen Ranch now stands was home to the Cahuilla and Serrano people for 500 years before Europeans came on the scene. They were nomadic people, who arrived in Joshua Tree in the spring and stuck around until the cold weather drove them south. Miners, cattle ranchers, and homesteaders began settling the area at the turn of the century, and they quickly depleted many of the resources that the native peoples used for their livelihood. The Cahuilla and Serrano people departed permanently soon after, but they left behind enigmatic pictographs and petroglyphs that can still be found around the park today. Bill Keys came on the scene in 1910, as the superintendent of the Desert Queen Mine. He was young and single at the time, and in 1915, when the mine was floundering, he took ownership of the property in lieu of back pay that was owed to him. Bill married Frances May Lawton soon after and brought her back to the ranch to homestead the land more than 50 miles from civilization. Together they would thrive at the ranch — Frances kept a huge garden, an orchard, and livestock to feed her growing family. Bill would keep busy building roads, staking claims, rustling cattle, scavenging, prospecting, collecting machinery, and building dams. Before there were cars on the Desert Queen Ranch, a trip to town required two days and lots of planning. With the exception of sugar, coffee, and flour, everything the Keys family needed was produced right on the ranch. They butchered their own animals and canned several hundred jars of food to get them through the harsh winters. For a time, Frances homeschooled her children, but in 1932, Bill built the Desert Queen School and hired Oran Booth to teach the kids, along with the children of several other homesteading families in the area. In 1943, Bill Keys was traveling home from town on a road that crossed his neighbor, Worth Bagley’s property. There had been ill feelings between the two for years, but on this particular day, Mr. Bagley was waiting in ambush for Bill. He claimed that Bill had shot some of his livestock and pulled a gun on him. Worth Bagley fired several shots at Bill, but missed every time. When Bill fired back, Worth Bagley fell down dead. Keys immediately turned himself in to the local authorities, and he was quickly convicted of murder and sent off to San Quentin. While Frances struggled to keep the homestead running, Bill spent five years in prison reading, writing, and relaxing. For a man that worked as hard as Bill, a stint in prison was a bit like a vacation. Bill was fully pardoned in 1956, when it was determined that he acted in self defense. Joshua Tree National Monument was created in 1936, and Bill and Frances took full advantage of the tourists by renting out cottages on the ranch. This brought a bit of extra income to the ranch. By the 1960s, many of the neighboring homesteaders had moved away, and Bill and Frances’s own children had all married and settled elsewhere. Frances died in 1963, and Bill sold the ranch to the National Park Service. He continued to live on the ranch until his death in 1969. He was 89 years old. Where: Joshua Tree National Park is located in Southern California, within a day’s drive of Los Angeles, San Diego, Phoenix, and Las Vegas. When: Joshua Tree National Park is open year round, but the best time to visit is early spring or late fall. Tours of the Desert Queen Ranch are offered Thursday through Saturday at 2pm, from October through May. Cost for admission: $25 per carload will get you into the park. It’s good for seven consecutive days. Tickets for the Keys Ranch tour are $10 per person. Amenities: There are four visitor centers in the park, all with toilets and running water. There is no cell service or Wi-Fi. , and then rent a car to drive to Joshua Tree. It’s a three hour drive, but quite lovely. Dozens of car rental provides are available right at McCarran International Airport. Book Now & Save 50% on Rental Cars – Search, Book, Done! Lodging: There is no lodging within the park, but several gorgeous campgrounds. Read our review of Jumbo Rocks Campground, which is awesome for families. You can find all types of lodging in Palm Springs, Joshua Tree, and Twentynine Palms. We scored a $69 room in Twentynine Palms on Trivago during our January stay. Road Trip Ideas: Bucket List Publications has a fabulous post about road tripping around Joshua Tree National Park. It includes a jaunt on Route 66 and a visit to the baron Salton Sea. Great post. Thanks for the info of this location. Hopefully I can go to this place soon. What an awesome story! I recently interviewed an Italian man who had visited Joshua Tree and he had an amazing story as well. I love hearing people’s actual accounts because it gives it that much more credibility and life. Thank you also for the useful location, times info as well as the lovely photos. I’d really love to get there to experience it for myself one day. 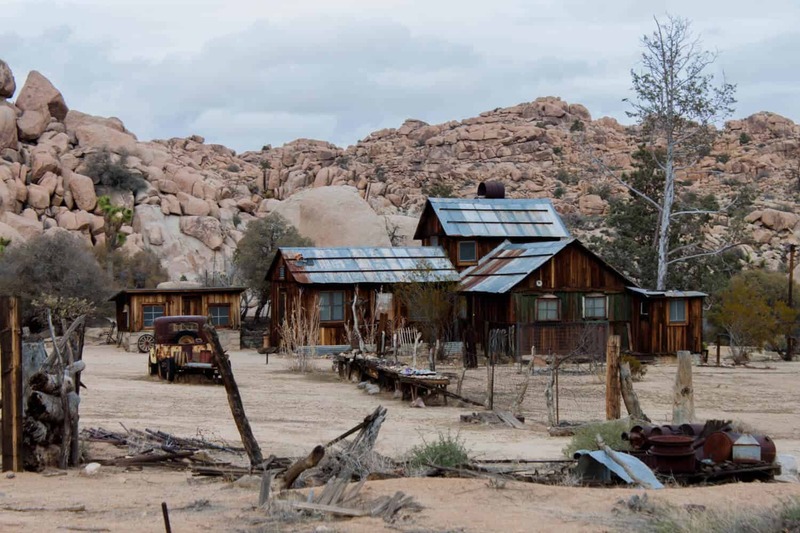 Joshua tree is on my bucket list and this ranch looks like the best place to be. How did you get on the ranger-led tour? Thats one thing, I def wanna do. Hi Jo – To do the tour, you have to visit the Oasis Visitor Center between 9 and 12 am on Thursday, Friday, or Saturday. Buy your tickets and then you meet at the gate to the ranch 15 minutes before the tour. We loved our time in Joshua Tree National Park, though we didn’t know about the Ranch – it sounds so fascinating though so I would love to get back. I really love learning about and immersing myself in local history while exploring an area. And hearing about the stories of the people who had their lives here. Love that they’ve preserved this heritage for visitors. This ranch seems to have a lot of history. I love wooden small cottages. They make you feel so intimate and dreaming of a small fire to watch in the evening. There are so many natural parks that have hidden places and history to tell. My husband wants to vacation in Las Vegas.. Now I have a reason to say sure honey let’s make a plan. What a great story. Oh my gosh this looks like a fun stop in Joshua Tree! We actually just went for our first visit while we were in Palm Springs but only had time to do a few hour visit which obviously wasn’t enough! I would love to go back and spend a week just exploring Joshua Tree and stopping at the Desert Queen Ranch! I went to Joshua Tree a little over a year ago and did not know about this ranch. I wish I had because it sounds like such a fun tour. I like it when the tour guides are entertaining. There is nothing worse than a tour guide that is hating their job. Your photos are amazing! I am actually heading to Vegas in September. I did not realize this is only a 3 hour drive. I am going to look into a day trip to this location. May still be a bit hot but seems like it is worth the trip and very doable in one day since the tour is not to long. Thanks for the tip that it needs to be booked in advance as I can start looking into it now. It might be a bit hot in September, but it’s so worth it, Joella. You just need to buy your tickets the morning of the tour. Have fun! Thanks for the tip on getting a ranger-led tour reserved in advance. I have been looking forward to a Joshua tree NP visit. Reading this blog made me all excited to visit Joshua Tree National Park. My favorite national park (so far), Natasha. There’s something for everyone. What a fascinating story! I love following real life events of people like the Keys who really put their mark on history of an area. It just gives everything that you enjoy experiencing an extra dimension. Thank you also for the useful location, times info as well as the lovely photos. I’d really love to get there to experience it for myself one day. You’re welcome, Nicole. I agree – I loved hiking around Joshua Tree, but when I learned more about the people that called this place home, I was totally amazed. It seems like such a harsh environment to live in!